Dustin C. Barrows, a respected citizen and a veteran of the Civil War, died Friday morning at his home on West Main street from the effects of a shock, aged 79 years. He was born in Waltham, but has been a resident of this city about 45 years. For several years he was employed in the tannery operated by the late C.D. Keeler. 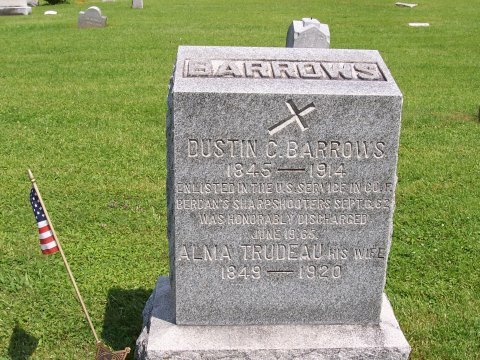 Mr. Barrows enlisted September 6, 1862, in Company F, 1st U.S. Sharpshooters, Colonel Berdan's regiment, and was mustered into service September 29, 1862, under Capt. Charles W. Seaton. He was transferred to Company E, 2nd U.S. Sharpshooters December 23, 1862. With this regiment he participated in the following battles: Antietam,Fredericksburg, Chancellorsville, Gettysburg, Cedar Run, Kelly's Ford, Miners Run, Wilderness, Spottsylvania, North Anna, Cold Harbor, Petersburg, April 2, 1864, Weldon R.R., Petersburg Mine, Hatchers Run, Deep Bottom, Petersburg June 15 to 20, 1864. On May 2, 1862 he was wounded in finger and wrist and was sent to a hospital in Baltimore, Md., where he remained for seven months, after which he rejoined his regiment. Besides a wife he is survived by four sons, Charles E. of Barre, Frank A., Ernest R., and Chester B., of this city, two daughters, Mrs. Eugene Brooks of Burlington and Mrs. Ralph Newton of this city, three brothers, Martin Barrows of Addison, Peter and Joseph Barrows of New Haven, two sisters, Mrs. Joseph Gravelle and Mrs. Joseph Gaunyea of this place. The funeral was held held Monday morning at St. Peter's Church.